Egress windows provide safety & allow a safe exit for tenants in your basement apartment. Basement apartments have become extremely popular over the years. They are a great way to increase your living space and home value. Our experts at Marshall Exteriors can create a basement apartment that is designed to meet your specific needs. Installing a basement apartment gives you the opportunity to earn rental income or provide a family member with separate accommodation. If you are considering having a basement apartment installed in your basement and you live in the The Greater Finger Lakes Area area, give us a call today! We provide free estimates for all basement finishing needs. A house with a walkout basement can provide a basement apartment with a separate entrance, which most homeowners appreciate. It is also a code requirement for any bedroom to have an exterior door or an egress window that can provide inhabitants with an escape route in the event of a fire. If your basement does not have an exterior door, it may be necessary to enlarge an existing basement window opening and install a larger window that meets egress specifications. A full-service basement finishing contractor at Marshall Exteriors will be able to advise you on egress window requirements and suggest the best location for installing an egress window or an exterior door. A new basement apartment provides you with the opportunity to earn extra rental income. This means the expenses for maintenance and heating and cooling can be covered in a simple payment by the tenant. It is even likely that maintenance services such as painting, cleaning and replacing the water heater can be tax deductibles. Check with your accountant for more details on renting out your basement apartment. Washer & dryer. An apartment with its own washer & dryer will be much more marketable than an apartment without these appliances. To save space, look for compact stacking models. Insulation. Insulating the basement walls will make the apartment more comfortable and less costly to heat and cool. A fireplace. A gas-fired fireplace with an attractive surround can be a cozy focal point in a basement apartment. Sealed-combustion models can vent directly through an exterior wall, eliminating the expense of a chimney. Convertible furniture. Versatility is valued in any apartment, and a convertible sofa/bed enables your apartment to accommodate visitors from time to time. Also consider a drop-leaf table that can quickly turn a living room into a dining room on special occasions. Extra closet & storage space. Renters appreciate generously sized closets and extra storage space because these features make it easier to keep an apartment neat and organized. Your basement apartment needs a bathroom and small kitchen to function as a completely separate space from your upstairs living area. To handle the electrical requirements of this space, an electrician will probably want to install at least two new circuits at your main service panel – one for lights and one for receptacles. As for the new plumbing, special self-contained basement toilets and compact, high-performance pumps have made it possible to install a basement bathroom without extensive excavation beneath the basement slab. Marshall Exteriors can neatly work around areas like the electrical box and create a space for your new bathroom area that is beautiful and private. We can also install the finishing touches to your bathroom, including unique bath fixtures and shower designs. Contact our basement experts today! To get the best results when finishing a basement, talk to the experts at Marshall Exteriors for a free estimate. 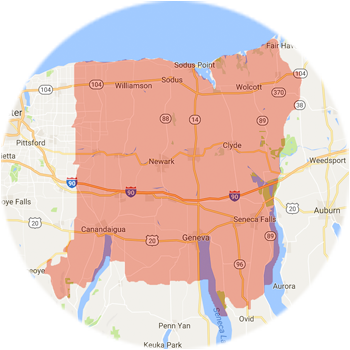 We proudly service homes throughout Geneva, Fairport, Newark, Canandaigua, Victor, Ontario, Seneca Falls, Waterloo, Farmington, Macedon and surrounding areas of New York. We can handle the wide range of work your job requires – from waterproofing and egress window installation to plumbing, electrical and insulation work. With a full-service basement contractor, you can be sure that the best design idea techniques and materials will be used, creating new living space that's comfortable, attractive, and sure to stay that way for a long time.